Acts of kindness can show up in unexpected places. For New Jersey mom Kristen Braconi, her unexpected place was the local skate park. Her son has high functioning autism and ADHD, according to a Facebook post she left in a community group, but you "would never know by looking at him that anything was going on," she wrote. Braconi and her son's behavior therapist took him to the South Brunswick Skate Park to play on his scooter for his fifth birthday. While they were there, some older kids showed up to skate. Mom Kristen Braconi was moved when a group of teens included her son, who has autism, at the skate park. What happened next moved Braconi to tears, according to the post. The older kids started playing with her son, teaching him how to skate with a mini board they loaned him. They even sang "Happy Birthday" to him. "They were absolutely amazing with him and included him and were so beyond kind it brought me to tears," Braconi wrote. She said she bought them all ice cream as a thank you gift, but it "wasn't enough." 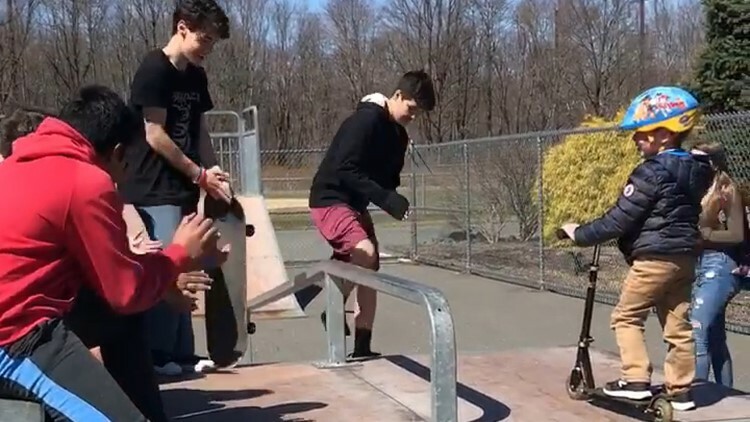 The South Brunswick Police Department recognized the good deed on its Twitter account and asked for the community's help in identifying the teens. They located the teens and awarded them each a challenge coin from the department's chief.